A while back a good friend of mine who's also a Scentsy Consultant donated a warmer for the giveaway I was having for Children's Hopechest - BUT I didn't get it in time to include in the raffle. Well I've had this burner with the intention of hosting a giveaway for a while and I'm FINALLY getting around to it. If you aren't familiar with Scentsy let me just say... WOW.. I LOVE them! I am not an aeromatherapy type gal, I don't burn candles or anything like that. I never thought I'd have a drawer brimming over with scents but I'm totally addicted. I have 2 large burners and 2 votive plug-ins in each bathroom. I actually get giddy when new scents come out especially around the Fall and Christmas! So of course I'm thrilled to share the love of Scentsy with you guys as well. This giveaway features 2 scents, "lots of love", and "radiance"
To enter to win just leave a comment below about what your favorite Scentsy scent is or what scent you're drawn to most as well as your e-mail address. For an extra chance to win you can also become a follower of the blog. Just mention that you're a new follower in your comment as well as your e-mail address. I love Scentsy! My favorite is Skinny Dippin'. My favorite Scentsy scent is Home for the Holidays ( if I remember it correctly). It is not a scent that takes over but it has such unique blend to it. I LOVE Scentsy! My favorite is the one that I bought last year called Cozy Fireside. I just have a little plug in. I'd be over the moon to win a warmer and try some new scents! I don't know anything about Scentsy! Crazy, huh? Sounds like something I should try though...sometimes the combination of my kids, dog and life could use a new "Scentsy." Oh, that's a gorgeous burner! I like Black Raspberry Vanilla! I'd love to try some Fall/Christmasy scents though! My favorite is the blueberry cheesecake. I'm following via e-mail subscription. My favorite is the Habana Cabana scent .. mmm tropical island here I come. I am fairly new to Scentsy, just have a few scents, but I am wanting to try them all! 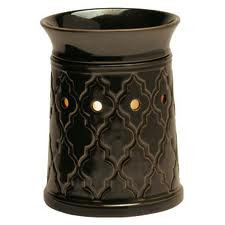 I haven't tried Scentsy in a warmer -- I still need the warmer part. :) I have a small sample (saving it up!) of Marshmallow Pumpkin and that smells wonderful even unwarmed! I am thinking I should try the vanilla-based scents, and the citrus ones as well, especially those with a lemon base. Yummm! I became a followed of this blog. Thanks for the opportunity! My favorite scent is Watermelon Patch, but its discontinued =( As for current scents I would have to go with peach a la mode! Back to school digital freebies! How to create a faux distressed look for $4.99! New blog design and some freebies!